I really liked this soup. I like that it’s fairly thin, but not watery. I like that it’s full of vegetables and crunchy goodness on top from the tortilla strips. I like that I can throw it together after Ina’s done cooking on the Food Network and have it on the table before The Phoenix walks down the stairs for dinner (which is almost 30 minutes on the dot in our house). It’s just a good soup to have in the old recipe box if you ask me. And you can still make it in half an hour even if you don’t have leftover shredded chicken on hand. Just slice your chicken breast in thin strips (and then again in bite-size pieces if you like) and add it in when you add the carrots and it will be cooked through by the time the carrots soften. Easy peasy. In a large stock pot, heat the oil over medium-high heat. Add onions, 1/3 cup cilantro and garlic, saute 3 minutes. Stir in tomatoes and spices, then bring to a boil. Add the broth and carrots. Return to a boil, then reduce heat to medium and cook another 10-12 minutes. About 10 minutes in, add the chicken to give it a little time to warm through. Meanwhile, toast tortilla strips in a 350 degree oven for 5-7 minutes, or until crispy. Stir in the cheese once the chicken is warm. Remove bay leaves before serving. 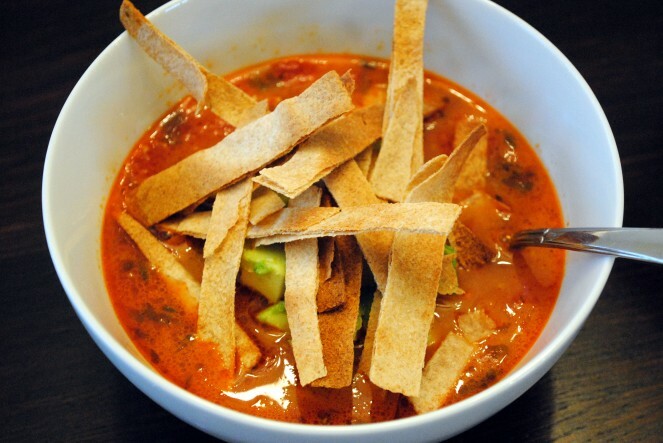 Ladle soup into bowls and garnish with cilantro, avocado and tortilla strips.